Continuing with our video tutorial series, here’s one on creating calculations and using formulas. This one briefly looks at how to create calculated fields, but quickly delves into more complex formulas and functions. This one would be worth watching, even if you’re an expert — it may give you a few new ideas. We’re in the midst of putting together video tutorials that cover each of Strata’s main features. I figure I’d leak some of these ahead of time on this blog, as many may find them useful. This first video is sort of a basic “rules of the road” for getting around the Strata interface. It’s a little over 3 minutes long and covers things like using tabs, panels, various views, and controls in the table view like moving columns and editing. If you’re an expert Strata user, you’ve probably already got these bases covered. However, there’s a good shot that many people will probably pick up at least one thing new. Calculated fields are one of the cornerstones of data analysis. It’s just one of those tools that you end up using again and again. And, if you can master the functions and formulas and make them do your bidding, you’ll be well on your way to becoming a data Jedi. This article begins a multi-part blog series on using calculated fields in your projects. 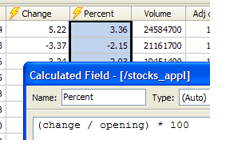 Calculated fields are nothing more than a way to apply a formula to existing columns or fields. (As a quick aside, spreadsheets use the terms row/column, whereas databases use the terms record/field — there are some technical differences, but for our purposes here, they are very similar). A poor man’s calculated field is found in a spreadsheet; you create a formula in a blank cell and then drag the cell down to apply it to the other rows. The more traditional calculated field is found in the database world. Here you create a new field that encapsulates a calculation and then you run it across the entire table. With Kirix Strata, you get a calculated field like that found in the database world, but with the dynamic/instant properties you get in the spreadsheet world. So, when you create a calculated field in Strata, you get a calculation that applies to the entire data set instantly — whether its 10 rows or 10 million. In addition, these fields behave like regular ol’ fields, so you can reference them in other calculated fields or use them in your sorts, filters, groups, relationships, queries and other operations. Of course, the actual data can’t be edited like in a regular field, but the underlying formula can be tweaked — with the results showing up in your view in real-time.